Look at the Cruel + Tender brochure and listen to interviews with two featured photographers, Rineke Dijkstra and Fazal Sheikh. Add relevant notes to your learning log. ‘Cruel + Tender’ was the first exhibition at Tate Modern to be specifically dedicated to photography. Through the selected work, the curators (Emma Dexter and Thomas Weski) intended to explore complex ideas of how the ‘real’ is represented through photography and the problematic nature of documentary in relation to the notion of truth. They describe this ‘fascination with the real’, and, ‘the lure of the authentic’ as symptomatic of contemporary existence and something which photography retains despite the arrival of the digital age. A conscious decision was made not to present an encyclopaedic survey, although the work featured dates right across the twentieth century. The practitioners chosen, although having a variety of approaches and aesthetic concerns, are united by a drive to look “their own times squarely in the face.” The two key figures of Walker Evans and August Sander, seen as not only historically important but also continuing to exert a powerful influence on contemporary practice, are the marker used to select participants and bodies of work. Criteria for this included a balance between engagement and estrangement, work that was analytical yet interested but not romantic, redemptive or solipsistic. The section criteria detailed above with Evans and Sander as the “chief historical axes for the show” gives an overall coherence of vision. Often I find exhibitions that feature a large number of photographers to be lacking in this respect which is perhaps explained by what work is available to the curator for selection or because they feel the need to provide an overview or greatest hits selection. This is partly avoided because work from specific series by the featured photographers is shown – the coherent sense of vision we gain from looking at these bodies of work is then transferred across the exhibition itself. Something that I would like to have experienced, which is described in the curator’s introduction, is the way works are presented in a non chronological fashion with the intention that comparison, juxtaposition and interconnection, either imagined or real, is allowed to take place between the bodies of work. The description of this intent reminds me of ‘The Ongoing Moment’ by Geoff Dyer which, albeit in prose form, does exactly this with Dyer linking photographers who on the surface appear quite disparate. This term was coined by Lincoln Kirstein when describing the work of Walker Evans and provides both the exhibition title and two aspects of the selection criteria. The term describes the cool passion Kirstein saw in Evans’ work and the phrase encapsulates the paradoxical nature of the photograph which can be simultaneously engaged with the subject matter and yet distanced in its presentation. The depiction of the real in the exhibition avoids nostalgia, romanticism, sentimentality and idealisation in favour of a clear eyed, dispassionate view. Two opposites of real, ideal and fake, denote the types of photographs that are excluded. Ideal – where a viewer is expected to have a particular reaction, for example photojournalism. Fake – the constructed or pictorial. Photography that is concerned with the appearance of things and pure description has a quiet narrative told without dramatic incident. The two series by Dijkstra featured in Cruel + Tender focus on individuals photographed just after an extreme event: matadors just after they have their bullfight and new mothers. The matador portraits have a fierce intensity that is difficult to read – the sense of heightened experience and the adrenalin from the bullfight is evident in their expression that is a mixture of relief and excitement. The bright costumes, blood and sweat contrast with the apparently neutral setting. The new mothers series display a similar tension and contradiction of emotions with the young women vulnerable yet radiating strength and pride as they hold their newborns close to their bodies. There is a sense that the lives of these women has changed forever with the birth of their children. The video interview with Dijkstra is illuminating as she describes that both of these series developed organically from her personal experience – because of the formal qualities of the work I assumed they were conceptually driven. Her stylistic choice to always isolate the people in her photographs is explained by the belief that featuring too much of an individuals personal life could stop the viewer being able to identify with their situation – her photographs are about universal experiences rather than specifics about an individuals life. This is something I would agree with – although I have neither experienced a bullfight or given birth I can identify in different ways with the people and situations in the images. I was interested by Dijkstra’s comment that her new mothers series has been praised by women as accurately reflecting how they felt after giving birth and criticised by men that women should not be shown this way. I must admit that I have always felt slightly uneasy viewing these images, however, I recognise this is a symptom of my own insecurities rather than the images themselves. Sheikh‘s series ‘A Camel for the Son‘ is a longform project about the refugee crisis in Somalia. These images are consciously in opposition to photojournalism – an approach that is typified by a focus on victimhood and dramatically depressing circumstances. 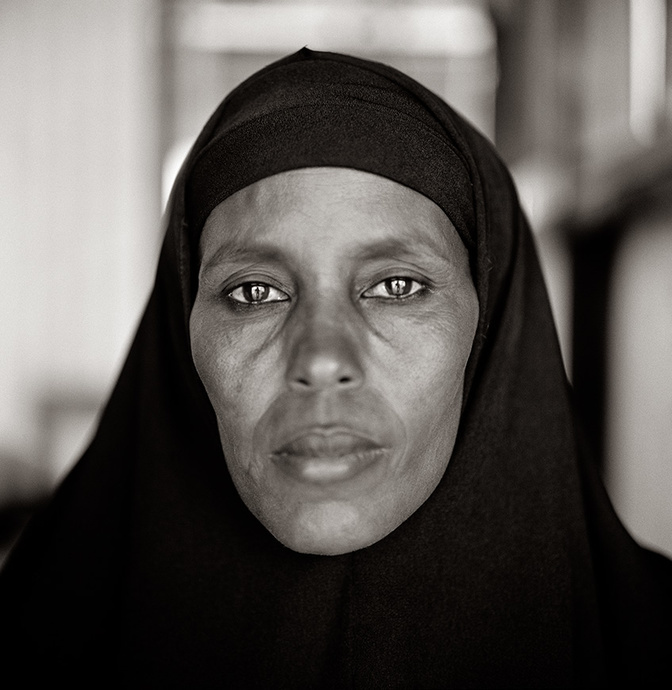 Instead, Sheikh seeks to show his subjects as not being defined by the things that have happened to them (he describes being disheartened by the media portrayal of the Somali people as ‘malnourished, haggard waifs…victims of this cruel world’) – the portraits have dignity and restraint rather than a voyeuristic tendency. The plain, direct and even artless approach imbues the images with authenticity. In the Tate interview, Sheikh eloquently describes that he was driven by a desire to tell the story of the refugees as they were either unrepresented or shown in simple terms by the media. The images were taken over a ten year period with the status of the people changing from refugees to exiles. Sheikh’s views on the relationship between image and text is interesting. He describes the photographs as being a way into the story, however, it is the combination of the images and text together that tells the full story and has the ability to transcend the various separate parts. I do not know how the images were presented in the gallery space, but the exhibition catalogue only shows the images and the captions rather than the accompanying text – a shame since Sheikh passionately advocates that text and image should be shown together. I was unfamiliar with Sheikh’s work before looking at it for this project and I am impressed by the understated power of the images and the personal drive he shows in the interview. The portraits are powerful, compassionate and the collaboration and mutual respect between photographer and sitter shines through. Dexter, E. and Weski, T. (2003) Cruel + Tender: the real in the twentieth-century photograph. London: Tate Publishing.